Fair point NHM but in order for anyone to register a copyright on anything they need to provide proof of ownership to the design if neither side can do that then there should be no legal issue with anyone using the design. Ultimately LFL would not accept anything less than a clear 100% ownership of the rights. Hence if it falls into a stale mate (or an AA win) then I'd expect the haggling to start. hmmmm yeah see what you mean but if LFL cant prove in the current case they have ownership and neither can AA surely at that point legally nobody owns any rights in which case its a win for AA in his defence against LFL but on the flip side its a win for LFL in their defence against AA ( does that make sense i have a headache now ? ). Then ownership would be something that both sides either jointly or soley both parties would have to seek a judement on. Anyway, the song was written by some chap (dont know his name but we'll call him Dave) and for the past near 40-years he's received the songwriting revenues from this song. When it was recorded they brought in a session musician (Olly) to play the Hammond Organ at the start and middle 8. Normally session musicians get paid for their days work - nothing else. However the organ break for this Song was SO STRONG, that it became the catch for the sone. Everyone remembered the song because of the organ break. So last year Olly the Organ player took Dave to Court and argued that his influence on the song was so great that he should receive some of the songwriting rights. The High Court agreed and in doing so put the fear of God in several recording artists who suddenly realised that the people they had used to record their songs, could (in some cases) argue that they owed a piece of it. So basically the Court decided that BOTH Dave and Olly owned the rights together (like they were a partnership) so would have to share the songwriting revenues 50:50, However they did NOT backdate the agreement so Dave didnt owe Olly any backdated royalties, only from 2007. Kind or ironic that the title was "a whiter shade of pale"
First Abba and now this! To complicate matters even more the Hammond organ line of "A Whiter Shade of Pale" was inspired by the Johann Sebastian Bach's "Air on a G String"
not to be confused with "Hair on a G-String" written by....oh I'm only joking. With respect to the topic of intellectual property, in your opinion, is there a difference between design and implementation? 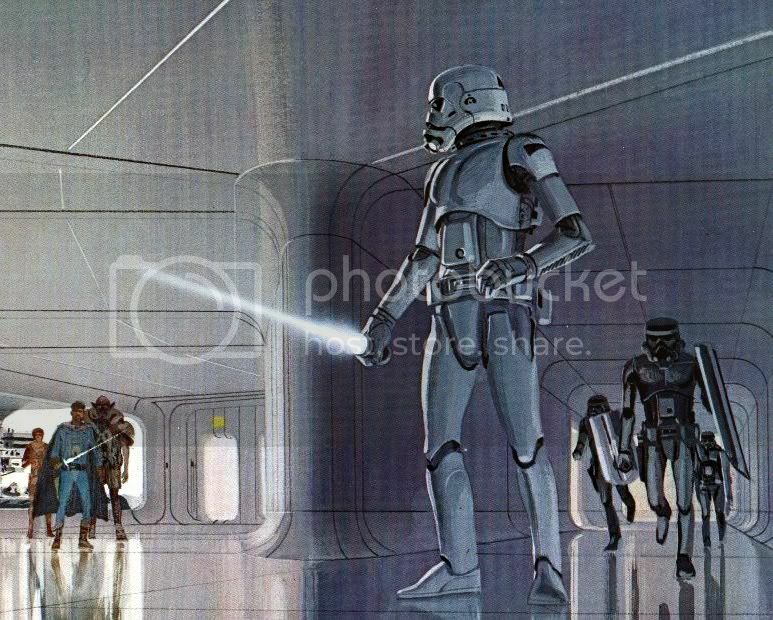 Are the above sketches the only known McQuarrie designs? 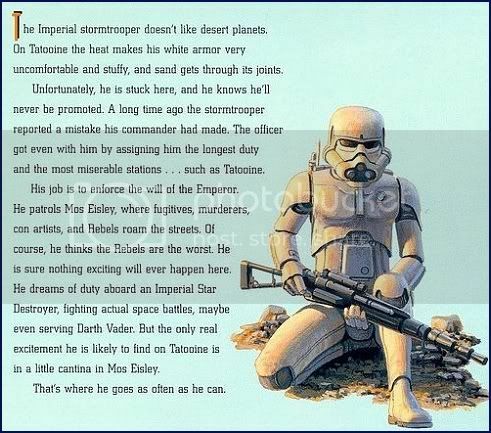 If so, the Stormtrooper as we know it is notably different. There are elements of McQuarrie's influence (mouth, aerator tubes, aerators) but that's about it. 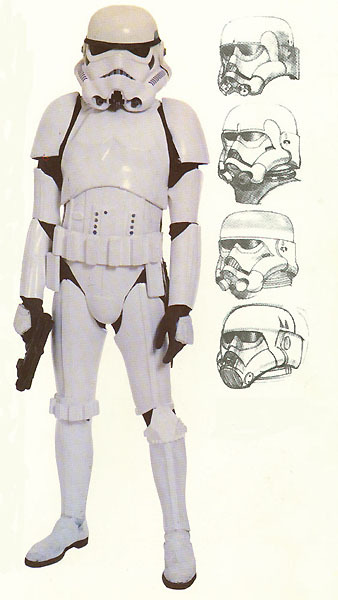 The second one from the bottom is perhaps the closest design to the Stormtrooper as we know it today. Mmmm... Copyrights can only protect up to something like 20 years, after which you can either refile it, but if you can't, it becomes public domain. Bach's work falls under public domain at this point, and his work preceeds modern copyright laws by quite a few years. Are the above sketches the only known McQuarrie designs? Two more, showing the armor as well. Well, those two have even more similarity to the current design. Maybe minus the blue stripes. The ears and the trapeziums are there. So it's pretty much a slam dunk to me. The design is pretty well established -- at least in 2D -- by Ralph McQuarrie. or whether there is a certain amount of "artistic craftmanship" in the stuff AA did that differentiates it from the RMQ painting. i.e. did AA actually "create/design" something himself, or did he just produce in 3D form something that was already on paper? The man who made the Spidey mask for the old television show starring Nicholas Hammond does not have any greater claim on ownership of the character, and to imply that he owns the character because he made a 3D mask just doesn't make sense with American intellectual property laws. 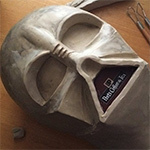 Okay, so if he can't lay claim of ownership to the character, does he have ownership rights of the molds? Sure, why not. Does he have rights to make castings? You see, this is the gray area. The way I read the lawsuit -- and the wording is highly specific -- the wording very much sounds like LFL would have been okay if AA didn't make grandiose claims (various claims have been proven false by LFL and by fan/collectors) and if AA didn't so boldly use LFL's trademarks. As a general example, if The Prop Den were to use the "Star Wars" logo on its site, LFL wouldn't shut it down; it's a fan site that generates no money and promotes the fandom which in turn benefits LFL because the fan are essentially doing a lot of free marketing and promotion for LFL, and LFL is very sensitive to its fans. However, if we started selling merchandise with the Star Wars logo, then we immediately walk right into the crosshairs of LFL's legal arm. Now there are makers who are making and offering kits; the 501st wear them, and Lucas made use of the 501st in the Rose Bowl parade. But very few makers go about making grandiose claims that essentially "on-up" themselves and make themselves automatically superior to the work off other craftsmen such that if you buy an AA/SDS you essentially are buying the holy grail of TIE Pilots, Stormtroopers, etc. Again, I feel -- based on the wording of the lawsuit -- that if Mr. Ainsworth had just promoted himself as just another humble provider, then LFL would have probably left him alone. Instead he had to "one-up" himself over everyone else. As I understand it, his bodysuit is ROTJ and a recast of someone else's armor. The counter to this is that the original stormtrooper armor templates were destroyed in a fire, so he had to do something. Humanitarian understanding aside, it would still mean they are not original, but LFL alleged that he was still claiming to be original and the holy grail despite the fact it's a "reconstruction". Further, by your own admission, the TIE Pilot was reconstructed. How can this be "original" when the entirety of the original TIE Pilot was not reproduced, but he had to go back to the stormtrooper molds and craft a helmet on top of it to convert it into an "original" TIE Pilot? There is a saying "the road to hell is paved with good intentions." I have no doubt Mr. Ainsworth is a very nice man, and anyone with any sense of reverence to Star Wars history would love to just be in his presence and talk about what it was like 30 years ago. But LFL's lawsuit seems to establish that it's not just one thing here or there but a calculated many things that comprise the reason why they sued him. If their Stormtrooper armor is allegedly a recasting of someone else's ROTJ armor, then it's clearly not the holy grail of stormtrooper armor. If his TIE Pilot is allegedly a rebuilding of his mold, then it's clearly not the holy grail of TIE Pilot helmets. Photos taken from Jez' site, can be removed if you wish. Nice one firebladejedi - absolutely use those pics - thats what theyre there for. Mac - I dont doubt thats how the copyright laws work in the US, however as we know this case is taking place in the UK and the background to this isnt so clear as the Spidey example you gave. As far as I can tell its more like... I come up with an idea to create a character, which I draw on paper. I ask you to take my drawing and to come up with a 3 Dimensional costume of that drawing. However what you come up with is different from my drawing. For some reason we fail to agree any form of contract before, during or after I ask you to do the work. SO who owns the copyright to that 3D work? The court needs to decide how similar your 3D design is to my 2d work, and whether you have merely produced a 3d version of my drawing, or whether you have added or modified the look through either artistic or functional requirement. Its therefore a very complex argument which is why its likely to go for many months, before it even gets to court. And then some. Its not wise to try and second guess what LFL was aiming for in their case. The reality is that they will try and go after SDS in as many different ways possible, rather than just relying on a single angle to their case. Hence they throw as many stones as they can, in the hope that at least one will hit its mark. I dont think AA did infringe on LFL's trademarks - certainly he refrained from using terms like "Star Wars", "stormtrooper", "tie", "death star" etc. etc. But irrespective of that, LFL were ALWAYS going to go after him as unlike anyone else, he manufactured in bulk, in a legitimate business environment paying taxes etc., and he advertised. He was open! The catalyst of it was probably Master Replicas, who didnt understand why they had paid for an exclusive license while someone else was out there making a competing produce (albeit 2-3 years earlier). However LFL was always going to try and stop him, and I think AA knew that and was prepared for that as he's always thought he was right. My apologies; any cross cultural misunderstanding was unintentional even though we technically use the same English words. In reading another of your posts, I thought you were stating as fact that Mr. Ainsworth had to rebuild his current TIE Pilot offering from a stormtrooper mold -- and not a fully made TIE Pilot mold made back in 1977. Can you clarify that then?